Do You Experience Trigger Points? Have you ever found yourself with a knot of tension in your back that’s tender to touch or rub it? And then you notice tightness, pain, swelling or numbness in the area? The problem is likely trigger points. Trigger Points are tight bands of muscles that may be felt as a knot. The knot happens when muscle fibers have bunched up under stress, exertion or pressure. There are about 620 different points in the human body that can be trigger points under the right conditions. When movements, exercise, sports training, overexertion or even stress become too much, muscles can bunch up suddenly, creating knot-like lumps. Many patients can even feel these lumps, which are tender and can become swollen. These are trigger points, and even if you don’t remember what caused them, the muscles did have a certain point at which they were triggered to bunch up. These trigger areas can result in decreased blood flow to the area of muscle tissue they are in. This allows scar tissue to infiltrate into your muscles. You’ll begin to feel pain that can become very severe and the trigger point will hinder healing of both the muscle and/or dysfunctional joint. Trigger points can restrict movement and cause muscle weakness and may cause referred and or radiating pain. Our trigger point injections are done to promote healing in the dysfunctional muscle. They take a few minutes and are very effective in the rehabilitation process. Some trigger points can become incredibly painful for patients, especially if they have been dealing with trigger points for a long period of time. We can do various methods of trigger point therapy to massage the knots out of your muscles. Deep-tissue treatment may be needed as well, even though the trigger point area may be very painful. 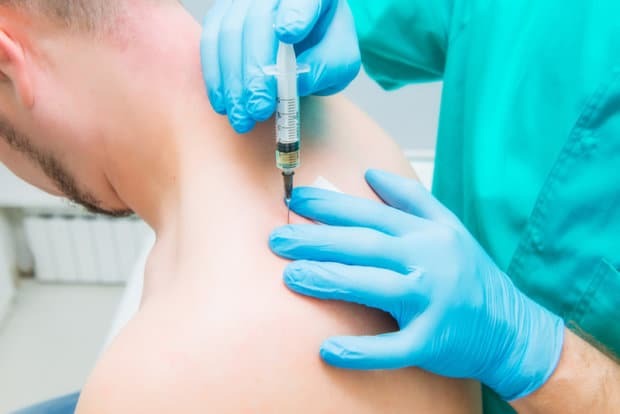 That is why injections are sometimes used to help with pain as the medicine promotes healing quicker in your dysfunctional muscle. We do various types of joint injections including knee injections, 3 different shoulder injections, and sacro-iliac joint injections. The knee injections utilize Supartz which in essence is a vitamin injection for the cartilage of the knee. It is designed to lubricate and decrease pain. Supartz also promotes normal cartilage healing and can be utilized to assist in the pain from osteoarthritis of the knee. If you have other conditions that affect the joint, you can help several conditions at once, as supartz also promotes normal cartilage healing and pain from conditions such as osteoarthritis. For trigger points, you would receive a nerve injection to calm down the nerves in the tissue that are giving you pain. For joint injections, you get the injections in the painful joint. You can feel immediate pain relief with an injection and we try to use the most natural medicines we can to treat the issue. All of our large joint and nerve injections are done under ultrasound guidance. The ultrasound is a safe and effective way to ensure patient safety as the injection is done in the proper place of the trigger point. It improves the effectiveness of the injection by insuring that the needle and fluid are going exactly where the practitioner wants. Ultrasound equipment is both non invasive and safer than x-ray methods because this equipment won’t send harmful lightwaves into your body. Have back pain that isn’t associated with trigger points? Come in for a consultation to be 100% sure. Other rehabilitative therapies such as chiropractic care or spinal decompression may be what you need when trigger points aren’t the cause of your pain. There is a therapy that will fit your needs based on if you have trigger points, chronic conditions, injuries, ailments, or simply want help with nutrition and exercise. To see how we can help you with your health, call Spine Correction Center of the Rockies today at (970) 658-5115!